Passage of the Day (POD) is a quick and effective way to review close reading and comprehension skills. Each of the 40 PODs consists of a short, engaging passage with two text-dependent questions to reinforce reading skills, and a bonus writing activity. There are two passages on each page. The pages are meant to be cut in half, with one half used each day. Alternatively, you could use the whole page if you want students to complete two passages in one day. 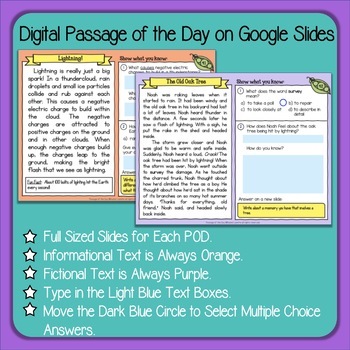 A digital version is also included for use with Google Classroom. Each POD is sized for a full slide and include text boxes for student input. Perfect for the paperless classroom. Please see the free preview for more information. Each POD is numbered in the upper right. All of the odd numbered PODs are informational text (nonfiction) while the even ones are all fictional texts. Set 2 includes PODs 41-80. Just for fun, the two PODs on each page are related in some way. Sometimes the connection is obvious, but often it is more subtle. As an extra activity, you could have your students tell how the passages are connected. There are two questions for each POD. The questions are a mix of short answer and multiple choice. One question (usually the first one) is a vocabulary or comprehension question while the other question focuses on some aspect of close reading such as inference, POV, main idea, summarizing, author’s purpose, text structure, fact and opinion, genre, analysis, etc. 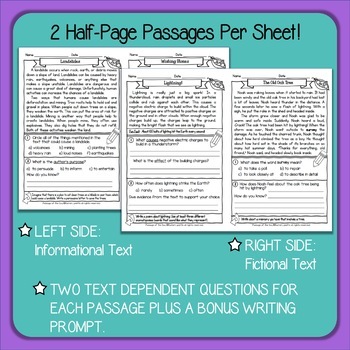 Each passage also includes a writing prompt for students to complete on the back of the page. The prompt is always related to the passage, designed to hook even the most reluctant writers, and will help your students to think critically and creatively while making personal connections with the text. Use it as an activity for early finishers, extra credit, homework, or as a required part of the assignment. There is also an optional lined back page for two-sided printing. Full page answer keys are also included. Get Passage of the Day Set 1 here. Sets 3 and 4 are coming soon! Each set will contain 40 passages and be formatted the same as this one. To access the student slides, you will need to have a (free) Google Drive account. When you click the link on the PDF that you will download after purchase, you will be prompted to make your own copy. Once you do, you can rename it and distribute it to your students through Google Classroom or whatever platform you use. You will want to make sure that your students each make their own copies so that no one is editing your original. -Use as bell work at the start of the day or for warm up before your reading block. -Create packets or notebooks and allow students to complete at their own pace. -Use as test prep or extra practice. These passages were written by me, Rachel Lynette. 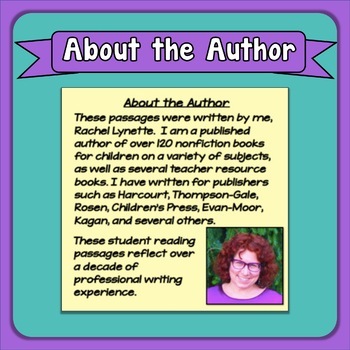 I am a published author of over 120 nonfiction books for children on a variety of subjects, as well as several teacher resource books. I have written for publishers such as Harcourt, Thompson-Gale, Rosen, Children’s Press, Evan-Moor, Kagan, and several others. These student reading passages reflect more than a decade of professional writing experience. Most of the Common Core Standards for Reading Literature (RL) and Reading Informational Text (RI) for grades 3-5 are addressed within this resource. There are a few standards that are beyond the reach of this kind of practice that could not be included. In addition, the Fluency standards for Reading Foundations (RF) are also covered. Everything included in this resource is licensed for single classroom use only. It may be photocopied by the original purchaser for his or her classroom only. It may not be put on the internet, sold, or distributed in any form. If you would like to share this product with your colleagues, please honor the time and energy put into it by purchasing multiple licenses on the product page on Teachers Pay Teachers. Thank you for respecting the copyright.